Philips BDP3000 review | What Hi-Fi? Of all our Blu-ray player reviews, this Philips is the first machine to sneak in with an RRP of under £200 – now, the high-definition format really is in reach for the masses. That said, a quick search online shows one of our current favourites, the Sony BDP-S360, can be found for as little as £160, some £80 lower than the price we originally listed. That player delivered all the necessary technical specifications, which this Philips doesn't – it's unable to decode DTS-HD Master Audio. It can bitstream this codec, however, and it can decode (or bitstream) Dolby TrueHD. If you have an amplifier that can do all the decoding anyway, none of this is a big issue. 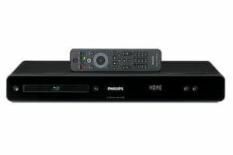 Round the back of this neatly curved, slimline machine you'll find HDMI, component and digital coaxial outputs – but no optical socket – plus an Ethernet connection and a USB input, which you'll need for the added memory required for BD-Live content. Huge menu icons make navigation simple. So, we're soon enjoying the fantastic action of Watchmen, and considering the knockdown price, there's certainly nothing disheartening about the image. Do an A-B comparison with a five-star performer, and edges lack a little sharpness and fast motion isn't handled so smoothly – but it's a good HD picture. The bright colour palette of the disc can look a little OTT, but more natural films show the Philips capable of good black levels, solid contrast and plenty of insight. Sonically there's a lack of weight and solidity, but the Philips will leave a fair few quid in your pocket compared to most, making it a good proposition.